Beautifully engraved certificate from the Bradshaw Realty Company issued in 1931. 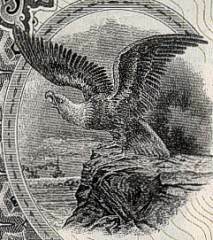 This historic document was printed by Pernau-Walsh Printing Co. and has an ornate border around it with a vignette of eagle standing on a rock. This item is hand signed by the Company's President ( John R. Cahill ) and Secretary and is over 73 years old. John R. Cahill was an engineering graduates of the University of California. He was a cofounder of the firm Cahill Brothers, which concentrated on building structures relating to the mining industry, such as stamp mills, lead frames and bunkers. In the twenties it turned to commercial and industrial projects in the San Francisco Bay Area and experienced such rapid expansion that it incorporated as Cahill Brothers, Inc. in 1923. In the late thirties, and at the end of World War II, the four sons of John R. Cahill joined the firm in various capacities, resulting in a new firm, Cahill Construction Co., Inc. which was formed in 1946. The two firms existed side-by-side under the leadership of the Chairman of the Board, John R. Cahill, until 1964 when Cahill Brothers, Inc. was dissolved.